One Mile is over, I ran three times in total and the best run was 275.3km/h! Here is the video from yesterday, I haven´t had time to cut the video from today but I´ll post it as soon as it is finished along with a race report. Great fun despite the rain that ended yesterdays race! My calculations put that at over 170 mph, WOW! Thanks! Not bad given the home brew fairings and "only" 150-160hp. Thank you so much Glen! 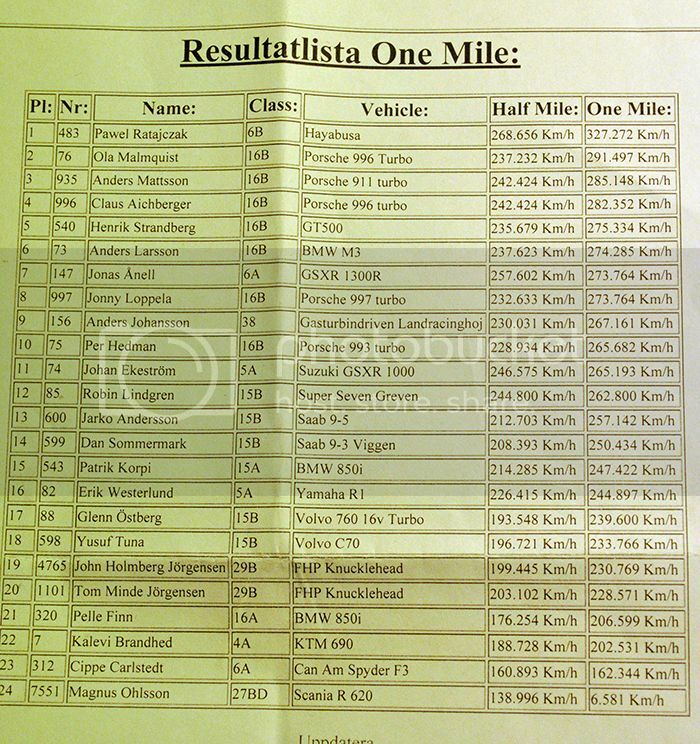 Here are the official results from the weekend, todays run was a test run only so it didn´t register. 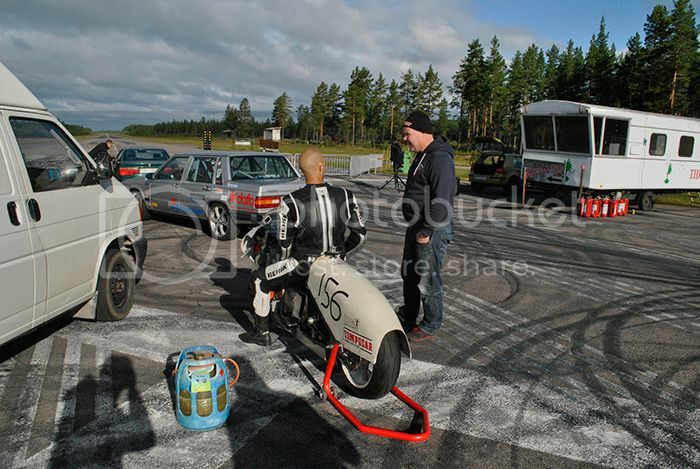 Not bad at all to beat the Porsche turbo and GSXR1000 with a home built bike! Wow, that is a real good meet. What is that thing on the lower right on the screen with the crosshairs and the red dot? I believe that's G Force. Contour HD GPS camera? Congratulations Anders! 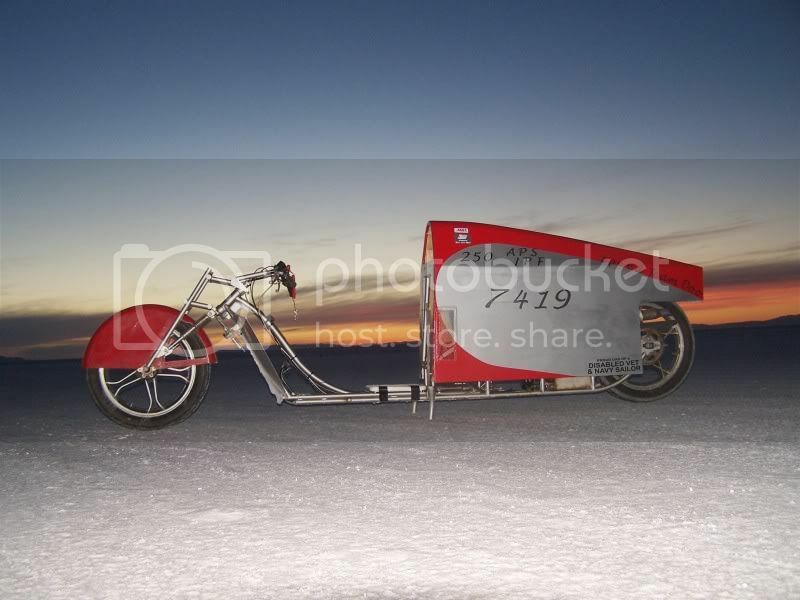 What an amazing achievement to go so fast on a home-built turbine! I love the sound of that engine as it goes by. Sounds like a jet plane. Exactly, it is a G force meter. I have a 5Hz GPS logger with me during the runs that one of my computer skilled friends analyze after every run, a very useful tool when making changes to the gearing, boost pressure and such. Thank you very much Don, it sure sounds nice when viewed from a distance. I was glad that the safety crew allowed my friends to stand there and video tape the run, I´ve never been further away from the running bike than a meter or so I´ve never heard it that way. I´ve just started to disassemble the engine to check for damage, no signs of heat damage at all to the gas producer which is great. 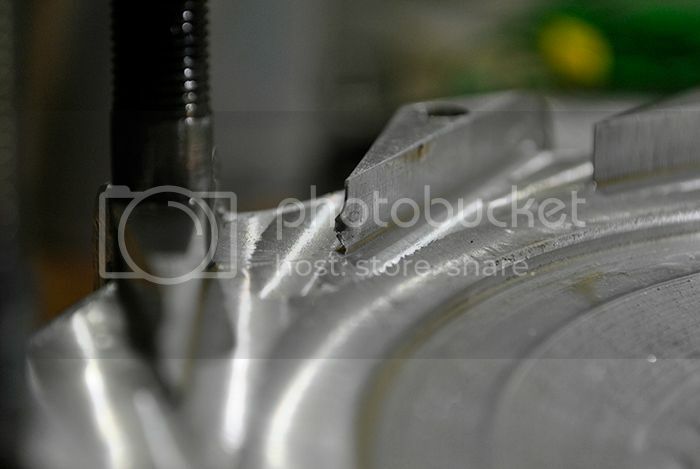 A few of the stator vanes in the power turbine section has cracked their welds so that needs to be fixed though. I´ll dig further into it and take some pics later. 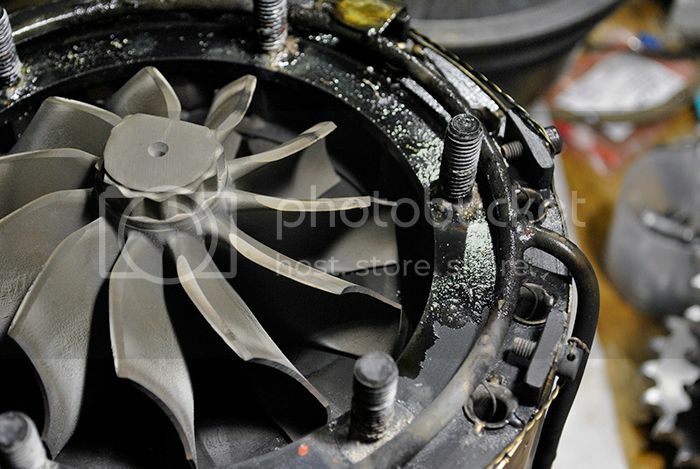 I continued disassembling the engine tonight hoping to find any clue why the engine has been running so hot lately. Even if the 1000°C interstage temps were a local hot spot it still feels like something has happened. 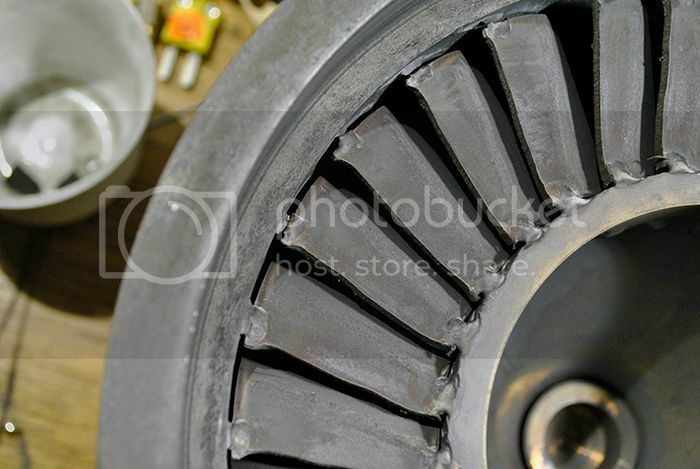 The turbine wheel looks very nice, sharp wing tips so no signs of overheating! Some minor damage to the compressor inducer wings tells me that something has been sucked into the engine since the last time I took it apart, lets find out if there is more FOD deeper inside the engine shall we? I didn´t have to dig far to find more damage, three of the diffusor wedges had their leading edges damaged like the one in the picture. This would surely upset the air flow and in the end cause some rise in exhaust temperature. How much I don´t know but most likely measurable. 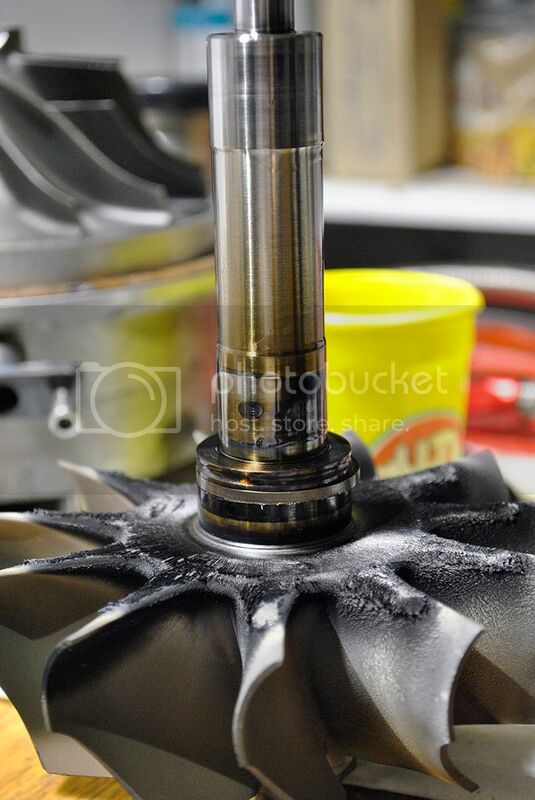 The last picture for the day is the turbine wheel, oil leaking past the turbine shaft seal has stuck to the rear of the wheel and the shaft has some bluening from the lack of post run cooling. If I run the oil pump after a run a small leak from the freepower shaft cause a fire in the exhaust so I can´t cool it that way for any longer periods. 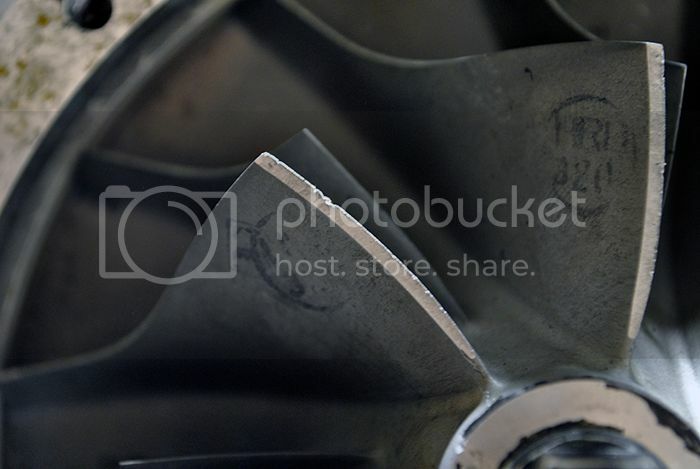 Anders, what material is the power turbine (with the cracked welds) made of? I think better welding (design and execution) would help extend the service life. Thanks for sharing all the info and pictures. The vanes are made from regular 304 stainless. I totally agree that the welding could have been better, there is very little room for the tig torch but I´ll try to weld the whole lenght of the vanes before I assemble the engine again. That looks to be a prime candidate for welding in a purge chamber. I've seen them made from sand blaster cabinets, or even from heavy gauge plastic inflated with argon. A little web searching will show a lot of options. Main benefits are you can really stick your electrode out to reach deep into a spot, and you are automatically back-purged all the time. Great for stainless, titanium, etc. Good idea, I will really need to extend the electrode if I want to reach all the way in between the vanes. I don't understand the "APS/[greek letter omega?]" in the thread title.